Homicide Detective J. P. Beaumont had little to go on: a body, definitely male and decidedly dead, with strange little puncture wounds. A friend had introduced my to J.A. 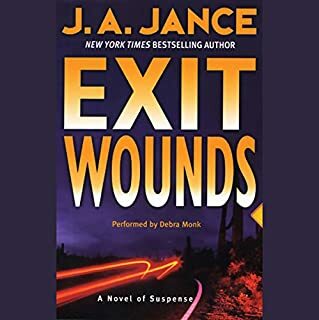 Jance books and I started the the Joanne Brady series and have enjoyed it. Read a few of the new Beaumont books but now have started at the beginning and working my way though. Beaumont has changed over the books which I find interesting. In this book Beaumont thinks or feels the main suspect is being framed. 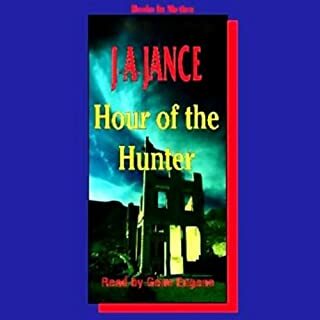 The book has interesting twists and turns and I was beginning to wonder how it was all going to tie together but Jance did a good job doing so. Enjoy the descriptions of Seattle. Unbelievable plot and characters; lousy writing. This was the first mystery by J.A. Jance that I've read, and I am apparently in the small minority who finds the writing lacking. Especially in the beginning, it sounded like a parody of the usual TV detective dialog with hackneyed phrases, stereotypical characters, etc. I knew what the character would say before he said it. 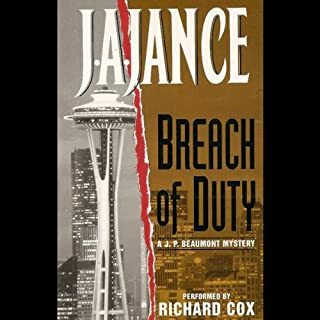 J. P. Beaumont seems to be not a particularly bright or insightful homicide detective, so I was surprised later to learn that he is a legend in the police department. The story is engaging, but Beaumont' sudden love interest is a totally implausible relationship, and his behavior is not only stupid but bizarre. The story goes on for a long time with mysterious murders and no hint of why. Beaumont makes little progress and overlooks the obvious until his former partner points it out from his hospital bed. The eventual resolution is not something that could be inferred from the evidence, although I did guess who the mastermind was. Altogether, a disappointing experience--not of the calibre of other detective series such as Connelly's Harry Bosch or Louise Penny's Inspector Gamache. The narrator seems appropriate for the subject, but his sentences are clipped and often sound affected. Reminded me a little of the legendary TV series Dragnet from the 1950's, but it doesn't work in the 21st century. I feel that the fans of J.P. Beaumont will love this one. It is so typical J.A. Jance. I enjoyed every page of this one. Another reviewer has done a wonderful job of outlining the plot, so I will not repeat what is obvious. 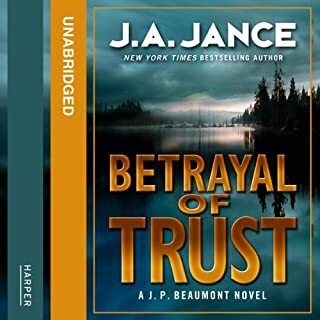 Jance's character developement (this author's strongest skill) holds very true to form with this work and we learn more and more of her detective Beaumont. We also get a look at the drug culture in that part of the country (Seattle of course) and some of the alternative life styles found their. This work has some fascinating twists (no spoilers here) and as one reviewer points out, just when you have things figured out, you get the rug pulled from under you. Of course, the book will be much better for those who have read the preceeding books dealing with this seattle Cop, but the book is also able to stand on it's own and is simply a good read. Recommend this one highly. Wit, well narrated and as always a good story. It’s one thing to express anger in your voice and another to express rage. This narrator doesn’t seem to know the difference between rage, anger and disappointment. They all sound like rage. It sometimes makes it difficult to listen to the story. 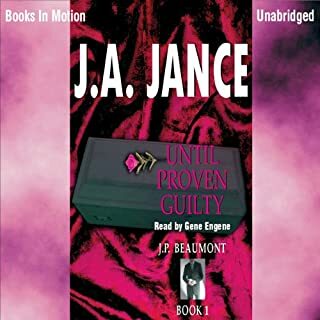 Love everything about this narration and am a big fan of J.P. Beaumont - EXCEPT when Mr. Engene reads "posh" with a long O instead of a short O. Makes me nuts. Great story, though! If you could sum up Taking the Fifth in three words, what would they be? What I liked best about this story was that there was a man, Ron Peters and a woman, Jasmine Day, who have both experienced life altering episodes in their lives. Ron was in an accident in the third book that has left him with an injury below the C6, a part of the cervical spine. Below the cervical spine is the thoracic spine which controls the functions of the body below the neck. Although his spine has only sustained bruising of the thoracic spine, Ron may regain minimal, partial or all functions below his neck. This injury has left him depressed and hopeless. There may be a possible relationship developing between Ron and his physical therapist, Amy. Ron has no lingering doubts but Amy isn't sure she's ready to commit to a ready made family that are Ron's two daugher's, ages six and seven. There will be a job opening in the police department that would involve a writing position. He had been a Homicide Detective but is thinking about accepting the life changing career being offered in the police department. The technology available would allow Ron to perform the criteria required for this job. There is also a woman, Jasmine Day, who has now been free of a heroin addiction for two years. She was a rock singer when she had an addiction to cocaine. Since her return to the stage, drug free, Jasmine is singing pop music, which is much milder. Jasmine was gaining popularity until cocaine dealer's are attempting to frame her as a cocaine dealer and who knows, her fans may think that her cocaine addiction has returned. Detective J.P. Beaumont, who used to partner with Ron Peters, before his injury and other members of the police department and the DEA are attempting to solve the mystery in order to exonerate Justine. Peters is also contributing useful detective skills that may be useful in solving the mystery. Therefore, both character's possess the hope that they might be able to return to their previous careers. Hope is eternal. Would you listen to another book narrated by Gene Engene? Yes, I would listen to another book narrated by Gene Engene. 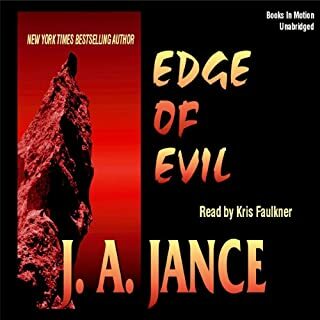 The previous three books in the series were narrated by him and I did rate his narration skills highter. However, maybe while narrating this book, he's having an off day or two. There are character's that actually make me jump because their voices are very loud. He also doesn't seem to exhibit control over the voice interpretations of the character's. Gene Engene is still able to create the emotions of the character's well. No, I did not have an extreme reaction to this book. I am looking forward to reading the fourth book in the series. The character's continue to develop in each book that I have read in the series. I'm not sure when this novel was published but the reaction towards homosexuality and aids isn't handled well. There is mention that new medication is being used that slows down the conversion from the aids virus to full blown aids. I'm sure that the next mystery will be a good one that is an easy read. Enough to keep my interest but doesn't make me sit up all night until its finished. I can lay back, relax and enjoy.